Tsleil-Waututh Nation v Canada (National Energy Board), 2016 FCA 219: The Federal Court of Appeal dismissed a statutory appeal from three interlocutory decisions of the National Energy Board (NEB) with respect to the Trans Mountain Pipeline proposal. Tsleil-Waututh Nation (TWN) challenged the NEB’s determination that the application for the project was sufficiently complete to proceed with an assessment and public hearing, a determination that included a listing and scoping of factors to be considered during the assessment, and an order detailing the steps and deadlines governing the assessment. While TWN raised complex arguments with regards to the NEB’s obligation to either discharge or assess Crown consultations, among others, the Court of Appeal dismissed its appeal largely on preliminary issues. The Court held that none of the challenged decisions were final and TWN ought to have first raised its concerns before the NEB itself rather than proceeding directly to the Court of Appeal. While the Court declined to intervene with respect to the Crown’s duty to consult at this stage, it did so without prejudice to TWN’s ability to challenge the final decisions of the Governor in Council on consultation for this project. Cowichan Tribes v Canada (Attorney General), 2016 BCSC 1660: The British Columbia Supreme Court allowed an application from Tsawwassen First Nation (TFN) to be added as a defendant in an action brought by Cowichan Tribes and others for declarations of Aboriginal rights and title in what is now the City of Richmond. While Cowichan’s claims overlap with TFN’s territory, as defined in its modern treaty, Cowichan argued against joinder on the basis that its claims are narrowly defined and do not overlap with any TFN lands under its treaty. The Court accepted that TFN’s rights to the portion of its territory in conflict with Cowichan’s claims are largely consultative, but held that these are still section 35 rights to be accorded recognition. These rights were also sufficient to provide TFN with a direct interest in the litigation. TFN’s rights under the agreement fluctuate depending on the land-holding status of the area underpinning these rights, and the litigation could result in the introduction of an extra party into negotiations over fishing areas that TFN has rights to under its agreement. Musqueam Indian Band v Musqueam Indian Band (Board of Review), 2016 SCC 36: The Supreme Court of Canada dismissed an appeal from Musqueam Nation against a 2011 property taxation assessment of a golf and country club on its reserve land being calculated on the basis of its use as a golf and country club, as opposed to its value as residential land. The reserve land in question was surrendered in 1957 for lease to the golf and country club and its value for property tax purposes was consistently assessed on the basis of the restrictions under that lease from that point on. In 1996, however, Musqueam amended its property assessment bylaw to reduce the types of restrictions that an assessor could consider to “any restriction placed on the use of the land and improvements by the band” (emphasis added). In 2011, Musqueam challenged the consideration of the restrictions under the lease in a property tax assessment on the basis that the lease was negotiated between the Crown and the golf and country club and its restrictions were therefore not imposed “by the band”. Musqueam also argued that the 1996 amendment was made to account for its newly recognized land management powers under the Framework Agreement on First Nations Land Management. Both arguments were rejected. Thompson v Manitoba (Minister of Justice), 2016 MBQB 169: The Manitoba Court of Queen’s Bench exercised its discretion to permit one of two class actions to proceed with respect to individuals affected by the 60’s scoop in Manitoba (Meeches v Canada). It also stayed the other proposed class action (Thompson v Manitoba), issued a declaration that no further proposed 60’s scoop class actions are to be commenced in Manitoba on the same facts without leave, and granted leave to amend Meeches to ensure it covers the class members from Thompson. While Thompson was filed first, counsel did not take steps to seek certification in a timely manner. Meeches was also framed more consistently with the Brown case that has already been certified in Ontario with respect to 60’s scoop survivors there. R v Drysdale, 2016 SKQB 312: The Saskatchewan Court of Queen’s Bench extensively considered the Gladue factors and Fetal Alcohol Spectrum Disorder (FASD) of an Aboriginal man in sentencing him for assault and threatening to use a weapon, relying on a full Gladue report and four witnesses for this purpose. The Court held that in the circumstances, a “needs based” as opposed to a retributive sentence was appropriate. The Court held that “a Gladue impacted individual affected by FASD has a reduced moral and legal responsibility” with respect to actions such as those underlying the offence in this case, which exhibited impulsiveness and a disconnect between actions and consequences common among FASD affected individuals. The Court also considered the Truth and Reconciliation Commission’s Call to Action 34, which focuses on better addressing the needs of offenders with FASD, in crafting its sentence. Treaty 8 Tribal Association v Barley, 2016 FC 1090: The Federal Court allowed an application for judicial review of a federal adjudicator’s conclusion that the Treaty 8 Tribal Association was a federal undertaking for the purpose of the application of the Canada Labour Code. The adjudicator was held to have failed to apply the functional test to determine whether the nature, operations and habitual activities of the Association fell under the head of power of “Indians, and Lands reserved for the Indians”. The Association provides advisory, administrative, advocacy and other services to its members and other First Nations, but does not provide services under the Indian Act nor within the realm of First Nations governance or reserve land. The habitual activities of the Association did not fall under subsection 91(24) of the Constitution Act either. Hazel v Rainy River First Nations, 2016 ONSC 5875: The Ontario Superior Court of Justice rejected the defendant First Nations’ motion for summary judgment and instead allowed summary judgment in favour of the plaintiffs in a defamation claim. 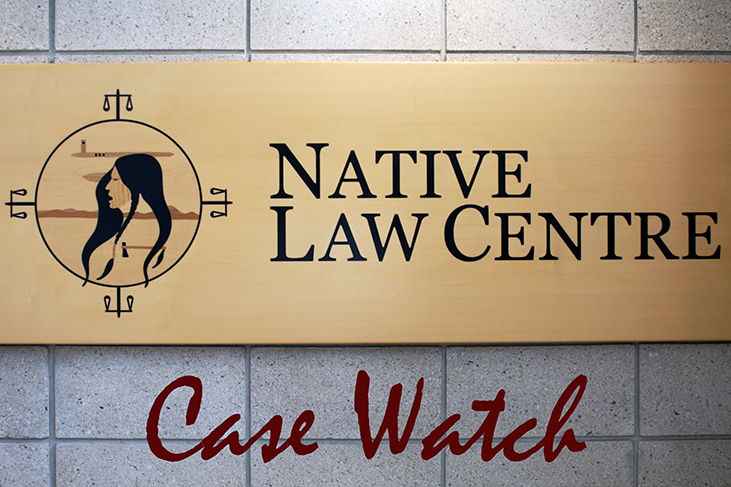 The defendant First Nations described the plaintiffs as “undesirables” in a band council resolution (BCR), declared them trespassers on its territory, and resolved that they were to be removed and charged as trespassers if they were found on its territory. The Court held that placing the BCR into a book available to community members was a sufficient act of publication for the purposes of sustaining an action for defamation regardless of whether anyone had looked at the BCR in question. The Court also held that there was no dispute that describing the plaintiffs as “undesirables” was defamatory. Arguments with respect to qualified privilege, issue estoppel and abuse of process were all rejected. R c Rice, 2016 QCCS 4610 (in English): The Superior Court of Quebec severed criminal charges against three men from Kahnawake in relation to the alleged sale of tobacco to non-Aboriginals without collecting and remitting the retail consumer tax from these sales to the federal and provincial authorities. The defendants raised a constitutional challenge in this case involving various rights asserted on behalf of the Mohawk Nation, including rights of self-determination and internal sovereignty, a right to harvest, produce and sell tobacco products, and a right to exemption from taxation under s 87 of the Indian Act. The Court held that there was no reasonable likelihood that the s 35 rights claimed, assuming they were proven, would be unjustifiably infringed by the defendants’ obligations to collect and remit consumer taxes from non-Aboriginal customers. The Court also held that there was no reasonable likelihood of the s 87 exemption being successfully invoked against the defendants’ obligations to collect and remit taxes from non-Aboriginal customers. The Court was unable, however, to conclude that there was no reasonable likelihood of the defendants being able to prove that s 87 exempted them from the imposition of duties on tobacco products. The two charges related to the last argument were severed from the others and the Court ordered for a trial to proceed separately with respect to the charges that were not implicated by this argument. Kikino Metis Settlement v Metis Settlements Appeal Tribunal (Membership Panel), 2016 ABCA 260: The Alberta Court of Appeal has granted permission to appeal on a question of law from a decision of the Metis Settlements Appeal Tribunal setting aside a membership decision by the Kikino Metis Settlement. Kikino has passed a bylaw that appears to provide it with discretion to reject an application for membership from a candidate who is otherwise eligible to apply under the Metis Settlements Act and meets the minimum standards for admission under the Act. An otherwise eligible applicant who was rejected for reasons not set out in the Act successfully challenged her rejection before the Appeal Tribunal. The Court of Appeal will allow an appeal to proceed on two questions: 1) whether a Metis settlement can establish membership criteria that is more onerous than the minimum standards under the Act; and 2) if so, whether the criteria applied to the applicant rejected in this case was a lawful exercise of Kikino’s jurisdiction under its membership bylaw. LM v British Columbia (Director of Child, Family and Community Services), 2016 BCCA 367: The British Columbia Court of Appeal dismissed two appeals related to the intention of the Director of Child, Family and Community Services to place a Métis child from British Columbia in the care of a non-Aboriginal couple in Ontario that has already adopted two of the child’s siblings. The appellants have been the child’s foster parents since two days after her birth and one of the appellants is also of Métis heritage. The first appeal was dismissed primarily because the appellants were found to be seeking an adoption order for which there was no basis in the statutory scheme. The Court of Appeal rejected an argument that the lower court had not paid adequate attention to the child’s Métis heritage, concluding that this was not relevant to the Director’s decision that the appellants were challenging on judicial review. The Court of Appeal rejected the second appeal on the basis that the Charter arguments that the appellants wished to raise were correctly found to be subject to res judicata and there was an insufficient evidentiary record to decide these argument on appeal in any event. R c Gilpin, 2016 QCCQ 9459 (in French only): The Court of Quebec allowed an application to stay criminal proceedings against two men in the judicial district of Abitibi on the basis that delays in these proceedings had violated their right to be tried within a reasonable time under s 11(b) of the Charter. The Court applied the analysis recently mandated by the Supreme Court of Canada in R v Jordan to conclude that the delays in each applicant’s case were beyond the presumptive ceiling for reasonable delay, and there were insufficient exceptional circumstances to rebut this presumption of unreasonableness. The Court acknowledged past jurisprudence where the unique circumstances of communities in northern Quebec were found to justify trials taking longer, but concluded that these circumstances will no longer be considered “exceptional” for the purposes of applying s 11(b). R c Rice, 2016 QCCS 4659 (in English): The Superior Court of Quebec allowed a s 11(b) application to stay criminal proceedings against three men from Kahnawake on charges relating to the alleged sale of tobacco to non-Aboriginals without collecting and remitting the retail consumer tax from these sales to the federal and provincial tax authorities. The Court held that even prior to the Supreme Court’s recent Jordan decision, the delays in this case would have been sufficient to ground an application for a stay of proceedings under s 11(b). While the defendants had presented a tardy constitutional challenge to the charges against them, this had no bearing on any delays they faced for the purpose of the s 11(b) analysis. Québec v Savard, 2016 QCCS 4391 (in French only): The Superior Court of Quebec allowed an application to stay proceedings in which Quebec is seeking to evict the applicant from a hunting camp. The applicant’s sole defense rests on his assertion that he is a member of the Métis community of Domaine du Roy and Seigneurie de Mingan and his community has Métis hunting rights that are protected under s 35(1) of the Constitution Act, 1982. Another member of this same community, Ghislain Corneau, was unsuccessful in defending himself from a parallel application for eviction from the hunting camp before the Superior Court of Quebec early last year (see Québec c Corneau). In Corneau, the Superior Court ruled that the Métis community to which Mr. Corneau and Mr. Savard belong does not meet the Supreme Court of Canada’s Powley test. Mr. Corneau has since appealed that decision to the Quebec Court of Appeal and an appellate decision remains outstanding. The proceedings against Mr. Savard have been stayed until the Court of Appeal renders its judgment in Corneau.